Storage Sheds - Who Has the Best Storage Sheds for Sale? Storage sheds come in a massive range of sizes, shapes and designs. Therefore, choosing the best one can seem like an impossible task. There are all kinds of factors that need to be considered. Are you worried about security? Perhaps you’re looking for a shed that has a unique, modern design? Or maybe you’re clueless as to what makes a good storage shed? Don’t worry if you’re struggling to choose between the hundreds of different models out there, WhatShed has you covered! So how did we decide which storage sheds deserved to be on the list? Well, we looked at all kinds of factors. Obviously quality and cost were the main factors we considered. However, we also looked at the unique features of each model and tried to include something to suit everyone. For some they want a private, secure shed, while for others they want a taller than average model. We also added storage sheds constructed from different materials including wooden, plastic and metal sheds. Whatever unique preferences you have, below you’ll find at least one shed that matches your requirements. With literally hundreds of storage sheds on the market, it was a very time consuming, difficult task to select the leading model. Therefore, we highly congratulate the Traditional Superior Apex Shed for standing out as the number one on our top 20 storage sheds league table. No matter what type of garden building you’re searching for, WhatSheds independent, in-depth reviews can help you to make a wise choice. At WhatShed, we have become firm fans of the Treetops Traditional range. So when it came time to choose our very best storage sheds, it wasn’t a hard choice for 1st place. The 8×6 Traditional Superior Apex Shed is a spectacular model with a long list of brilliant features. Quality is obviously the first thing you want to be sure of when you’re investing in a shed. That’s one thing the Traditional range guarantees. 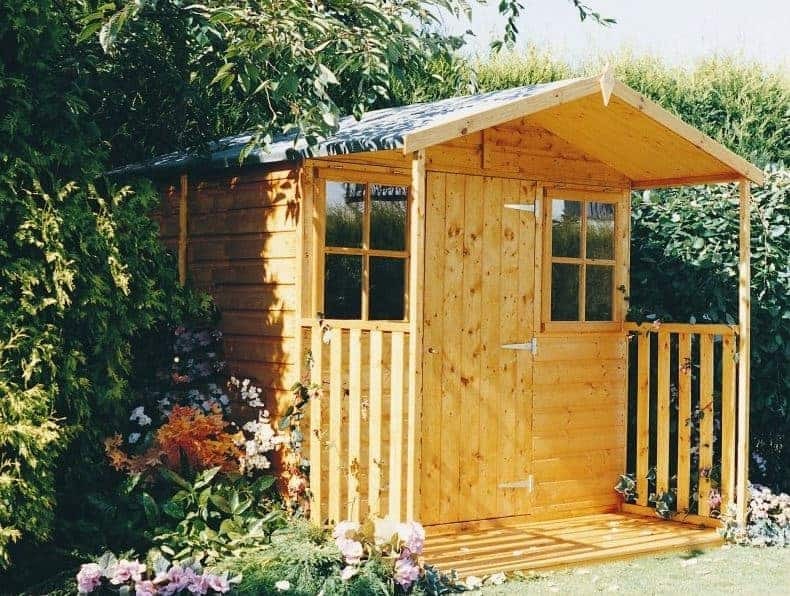 Created from unique Redwood pine materials, this shed doesn’t just guarantee quality, it also boasts a unique, stand-out stylish design that isn’t found on any of its competitor models. This remarkable quality is followed through to the interior of the shed, with even the door being ledged and braced for maximum support. Security is another major part of this storage sheds design. It comes with a lock and key, making sure anything you store is only accessible to you. Whilst its included features are impressive enough, the signature benefit of Treetops Traditional sheds is the fact there are so many customisation options available. You can choose to upgrade the cladding, felt, security and change the windows and door. It is possible to fully customise this shed to fit your needs. This definitely isn’t something most storage sheds offer. So if you’re looking for the best of the best this, in our opinion, is it. Another shed that never fails to impress us is the Mercia Ultimate Shed. Now this is actually available in a wide range of sizes. However, like the majority of storage sheds you’ll find on this list, we’ve focused on the most common, medium sized model. So what’s unique about this Mercia model? In short, everything! Starting with the exterior construction of the shed, you’d expect to find a 12mm thick cladding. This is what most storage sheds come with. However, this impressive model comes complete with 16mm Shiplap Plus cladding. Put simply, it’s the highest quality and thickest cladding you’ll find on the market. So what’s so special about that? Well, thicker cladding means extra stability, durability and security. A built in RIM lock also adds to its overall secure design, making it one of the best options to store valuable tools or equipment in. The two added windows are unique in the fact they are created from single glazing and they are fully openable. This makes the shed more insulated and quieter than your average storage sheds and also allows you to ventilate the building. It also benefits from extra tall apex height, making it one of the better choices for taller storage. This outstanding Biohort Europa 4 Metal Shed is well deserving of third place on the list. 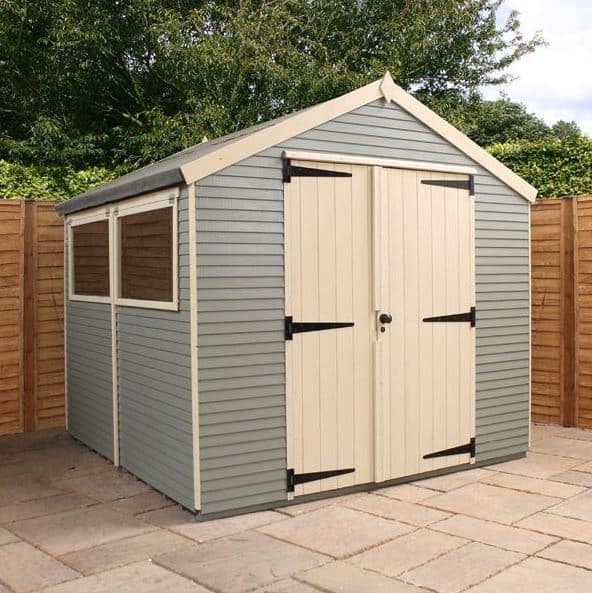 Ideal for those who are looking for a no maintenance, high quality metal shed, this great model is the best we’ve come across. Biohort is a well-known name in the garden building industry and it isn’t hard to see why. This model has been created with top quality hot dipped galvanised steel, meaning it’s going to last a very long time! It also comes with a substantial list of features. Its storage potential is another major reason we added it to the list. This is one of the most common sized storage sheds out there, but with this model its storage potential is increased thanks to a few useful accessories. These include two shelves, four tool holders and an organiser system that is fitted to the inside of both doors. 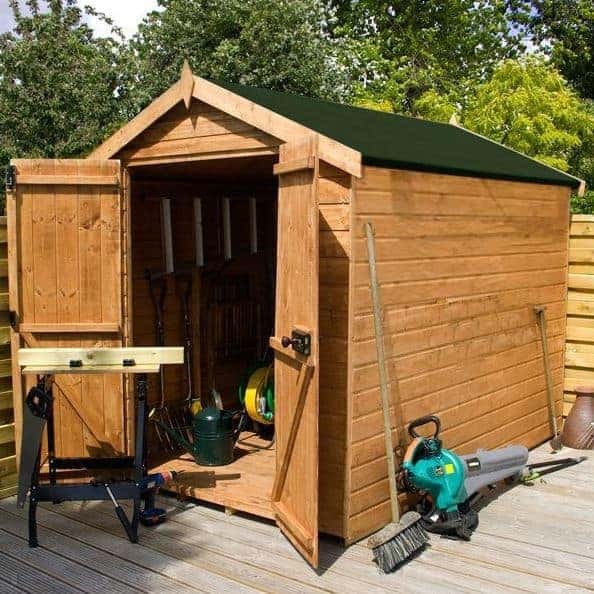 If you have a lot of tools, then this is definitely the best storage shed you can invest in. It’s also extremely secure. A cylinder lock and double locking pins added to both doors make this one of the most secure storage sheds on the market. It even comes with a spare key which is something most storage sheds don’t offer. Backed by a 10 year rust perforation guarantee and the fact it boasts a zero maintenance design make this by far one of the most remarkable, great value storage sheds on offer in the UK. This beautiful Woodland Trust 10×8 Heritage Reverse Apex Garden Shed doesn’t just boast a stunningly unique design; it also offers an extra-strong, environmentally friendly design. Not many storage sheds benefit from an eco-friendly design so this is definitely a unique benefit exclusive to this model. 5% of the proceeds from the sale of this shed goes to the Woodland Trust. So if you’re concerned with the environment this is a superb choice. We’re also super-impressed by its quality. Made from matchboard style cladding, it is the interior design that really stands out here. The floor is 16mm thick. This makes it the thickest floor we’ve come across and it offers significant benefits. 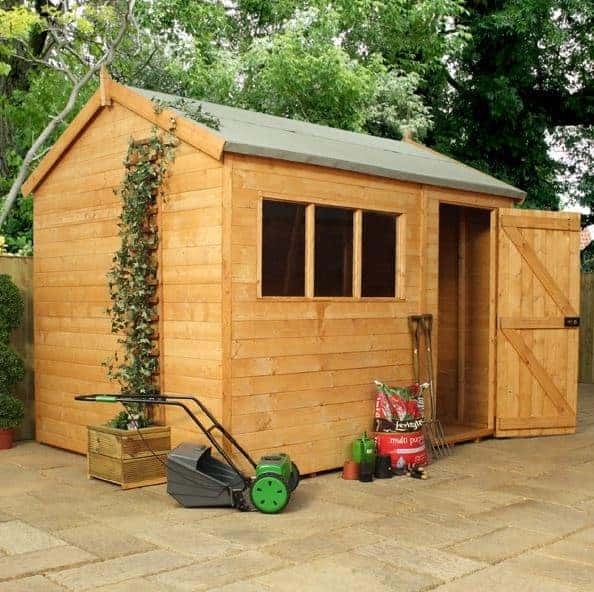 It increases the stability and strength of the shed, while also making it more suitable for heavyweight storage. The door is braced well making sure it won’t sag even with heavy daily use. Then there’s the fact it is actually built in the UK. Only the best quality materials are used. Its three fixed windows are also single glazed rather than styrene glazed. So basically every part of this sheds design focuses on exceptional quality. Its reverse apex style gives it a lot more character than average storage sheds on the market. So if you’re looking for something different that really outshines it competitors, we definitely recommend this one. The Shire Bradley 19mm Double Door Cabin is one of the newest models released in the UK. Despite its name, this is actually a very high quality shed, rather than a log cabin. Its main advertising feature is its super-thick 19mm clad walls. This means it is 50% thicker than most storage sheds available. We’re also impressed by its unique, striking design. There are a lot of beautiful looking storage sheds out there, but we’ve yet to come across one that is more stylish than this model. We’ve also chosen it for its great tongue and groove floor which allows you to store practically anything without worry of it caving in. One featured that has surprised us is the large panelled window. Now the windows of a shed don’t often impress us. However, the panelled single glazed window on this model is top hung, joinery standard and it is storm resistant. This isn’t something you come across very often. It’s also secured with a peg stay so you can be sure it’s both secure as well as extremely weather-resistant. This truly is one of the most solid, high quality storage sheds we’ve ever had the pleasure of reviewing. As well as being sold with the standard 10-year anti-rot warranty, it also comes with a 1-year structural guarantee. At number 6 we’ve gone for something a little different. This outstanding 6×8 Suncast New Adlington Three Shed is the most stylish plastic shed we’ve come across. It looks just like a small house, with realistic looking roof shingles. It’s highly unusual to come across plastic, or in fact any storage sheds with roof shingles at this price level. Created from metal reinforced plastic, they ensure the roof lasts just as long as the rest of the building. Its overall construction has really wowed us here at WhatShed. The plastic is blow-moulded and it comes with twin wall construction. Put simply, it’s an extraordinarily tough building. We mentioned its stylish look earlier, but we didn’t mention it comes with a 3-tone appearance. At the most, storage sheds typically tend to feature a two-tone design. So the fact this shed comes in sand with chocolate accents and a great woodgrain finish, really sets it apart. So what about its features? Well, these are equally impressive as the style and strong construction of the building. There’s fully functioning vents, strong, pad-lockable door handles and a reinforced floor. You can actually store a tractor in here, the floor is that strong! We love this shed and know you will too. 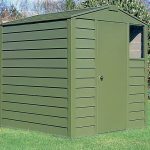 If you’re looking for storage sheds you don’t have to maintain, that will hold a wide range of storage and last for years then this is the one we’d recommend. The Waltons Dutch Barn shed is one we have featured on several of our top storage sheds lists. Sold in numerous sizes, this 10×8 model is ideal if you have large machinery or equipment to store. Obviously the first thing that captured our attention with this building is its unique Dutch barn design. 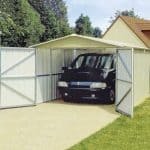 It boasts a much taller, broader design than most storage sheds, making it one of the few that can handle a wide variety of different sized storage. There are different variations of the shed available but this one comes with an opening styrene glazed window. Due to the size of the shed this is a great feature as it enables you to not just ventilate the building to make it more comfortable, but to actually see what you’re doing whilst you’re inside. Besides its stunning appearance, the shed also comes with high security, benefitting from a built in RIM lock. Space is the main thing the manufacturer has focused on in this storage sheds design. It has even made the doors extra tall and extra wide to enhance the amount of space available to enter and exit the shed. 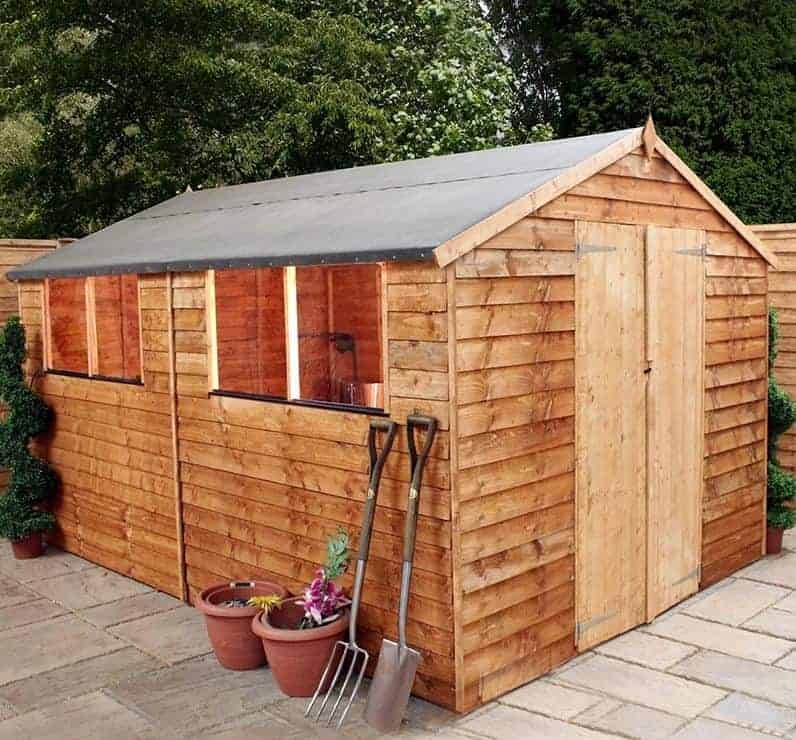 If you’re hoping to buy a strong, spacious shed that really stands out then this is by far one of the best options available to you. An alternative to the outstanding Traditional Superior 8×6 Apex Shed, this pent model from the same manufacturer is the highest quality pent shed available. Out of the hundreds of storage sheds out there, this is one of the few that you can really see the quality just by looking at it. The thick tongue and groove Redwood construction forms a solid, impressive looking building. Even the three small panelled windows give a high quality finish with their thick framed design. Only one of these windows can be opened, but there is an option to upgrade the others to opening windows too. In fact, it’s the massive choice of customisation options that leaves us speechless with this shed. Storage sheds, especially the higher end models, always tend to offer some kind of customisation. However, Treetops Traditional have far surpassed the standard options offered by most shed suppliers. With this model you can choose from five different locations to place the door, upgrade to opening windows or remove the windows completely, upgrade from a single to double doors and add floor bearers if you want to. That’s a lot of customisation options! We’re really surprised that a shed of this quality is offered at such a low price. We haven’t even mentioned its strong security features. An integrated RIM lock keeps your valuable items safe and fully secure. This is one of the very few storage sheds we can’t recommend high enough. Storage sheds come in all shapes and sizes and this Shed-Plus Champion Heavy Duty Pent Shed offers something 90% of other storage sheds don’t – it comes complete with a separate log store. 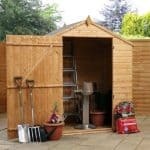 Whether you chop your own logs or not, this separate area can be used for all kinds of purposes, such as bicycle storage or a space for your garden bin. Its enclosed design means whatever you store in that section will be protected against the elements. It’s 2-in-1 design is a definitely selling point. In terms of its interior storage space, the Champion range is known for its extremely strong, durable and secure storage sheds. This model is certainly no exception. One of our favourite features of this shed is the door. It is ledged as well as braced, is hung by three hinges and has a built in lock for security. The opening glass window is also noteworthy, offering a toughened glass design. This is a very uncommon feature, especially at this price level. Another impressive feature we’re surprised to see is a pressure treatment. This guarantees the shed will withstand whatever is thrown at it for up to 15 years. That’s without any maintenance! The BillyOh 5000 range has consistently impressed us. 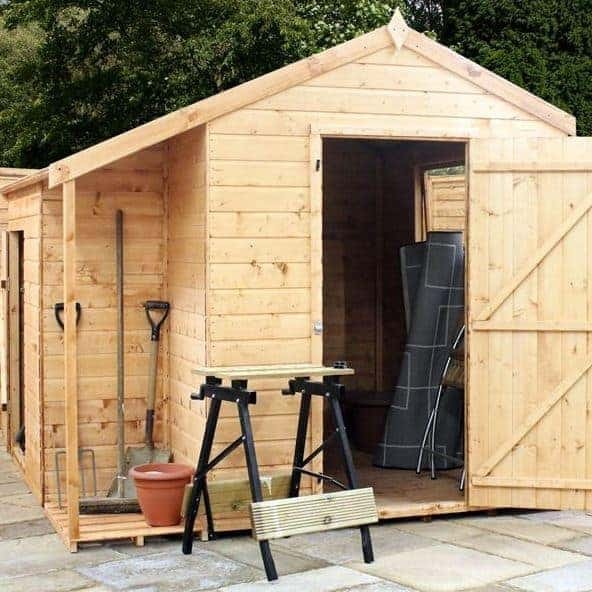 It is advertised as both a shed and a workshop and it comes with a long list of extras. BillyOh has recently undergone a few major improvements, making the 5000 range stronger, more spacious and taller than ever before. You get to choose your own floor, colour, base, shelving and guttering. If you’re looking for a shed you can truly make your own then this is it! The colour options are particularly worth checking out as there are 11 different colours to choose from, along with 3 separate trim colours available. BillyOh is one of the most trustworthy brands, with superior quality guaranteed. 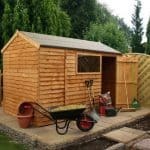 Whether you’re looking for simple storage sheds, or a building you can double up as a workshop, this is a great option. It comes in 6’ or 10’ wide sizes and the materials used to construct the building are the very best available. 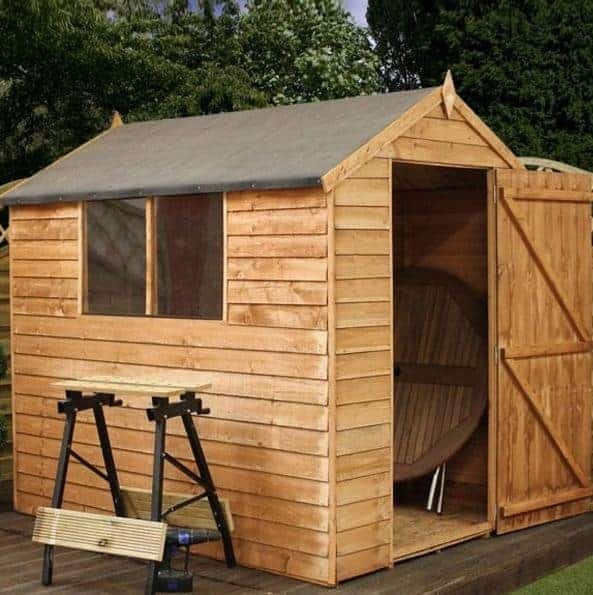 At a starting price of £403, this is one of the best high-end sheds you can invest in. 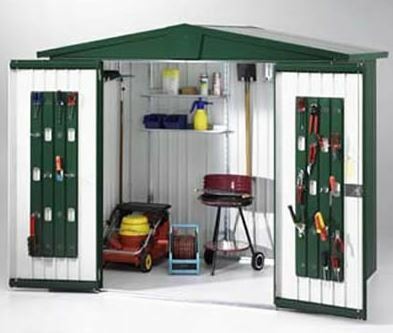 This is the second 2-in-1 shed to be featured on our top 20 storage sheds list. However, this one is a unique combi store model. What does this mean? Well, not only do you get a large interior storage area, but it also comes with an attached outdoor, shaded storage space. That’s not all – there is a further additional indoor storage area accessible via a separate door. This is ideal for storing smaller items such as garden tools and children’s outdoor toys. The shaded outdoor storage area could be used to store garden bins, BBQs or tall gardening tools. 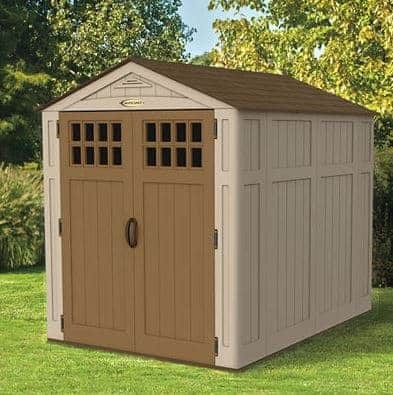 Its versatility and separate areas really make this stand out and it offers a more unique look than average storage sheds. It is built with FSC certified timber and consists of 12mm thick tongue and groove construction. This gives it an interlocking, weatherproof design and ensures it is strong and stable. If you’re looking for a garden building that has it all then this is definitely what you need. We especially like that the manufacturer has included a strong tongue and groove floor too. This highlights its great quality and also lets you store items of any weight without worrying about damaging the floor. 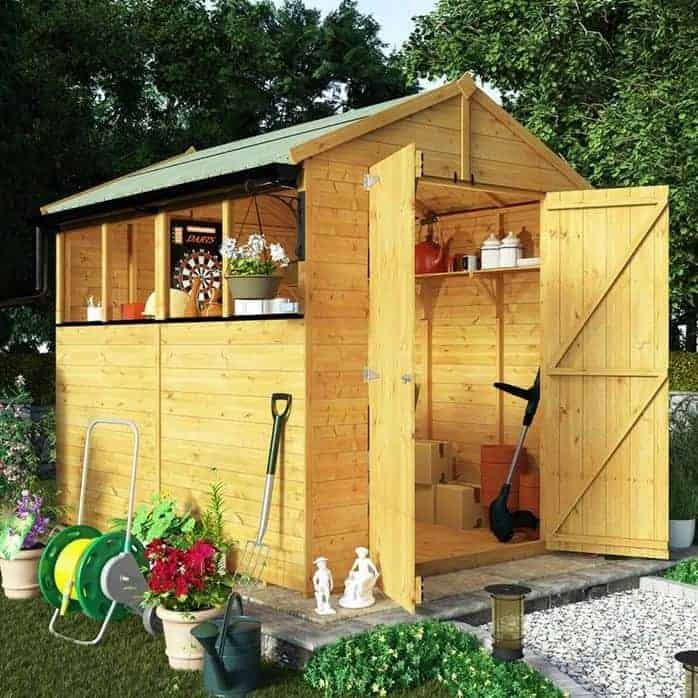 This extraordinary garden shed has received plenty of excellent reviews from happy customers and it isn’t hard to see why. It’s pretty hard to come across storage sheds that offer not just exceptional quality, but a stand out design too. This 6×8 model mimics the appearance of small cabin yet comes at a much more affordable cost! Created with 12mm tongue and groove, its thick walls are naturally very weather resistant. What we like however is that as well as managing to offer a completely unique, attractive look, this shed also comes with some very impressive, unique features. You can tell a lot about the quality of storage sheds by looking at the smaller details. Some focus purely upon making sure the cladding is constructed from high quality materials and then they scrimp on the rest of the building. This model doesn’t. Take a look at the door for example and you’ll see it comes with a very thick, strong braced construction. It has also been fitted with a RIM lock so security won’t be an issue. The interior is also constructed with 12mm tongue and groove materials increasing its stability and longevity. Add to this a slight roof overhang for extra weather protection and you have an awesome quality, great value for money storage shed. Wooden sheds are all well and good, but what if you want something you don’t need to maintain? Well, for those seeking a high quality, metal shed, this BillyOh Beeston range is highly recommended. 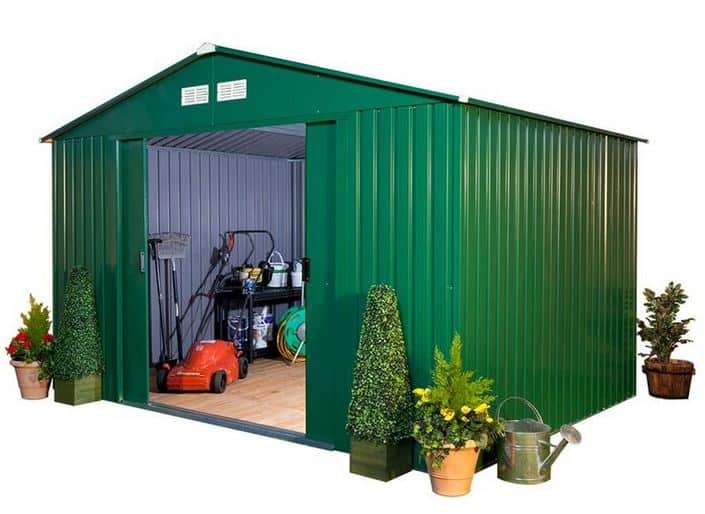 Created with galvanised steel throughout, it’s zero maintenance, low cost price makes this one of the most popular meta storage sheds you can buy. It comes complete with front and rear ventilated gables to make sure the building receives maximum air flow, reducing condensation and prevented rust. 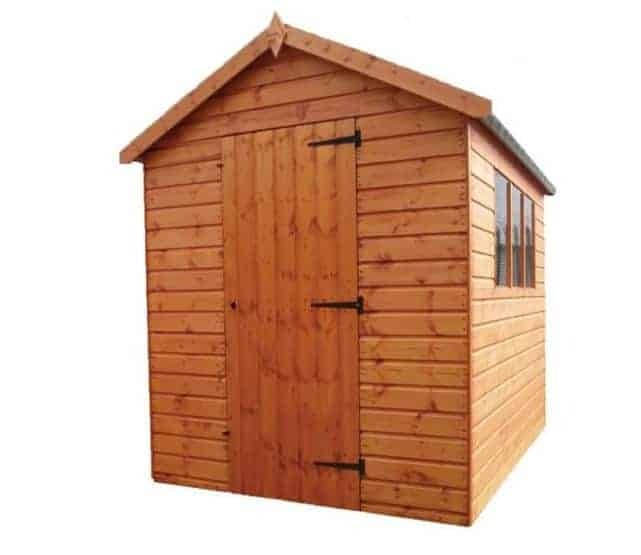 This particular BillyOh model offers much more head height than average storage sheds too. So if convenience and comfort are high on your priority list, this shed is a good investment. The walls and roof have been reinforced for additional strength and then finished with a coat of zinc to ensure it lasts a minimum of 15 years. Unlike a lot of metal sheds, this one also has ribbed wall panels which don’t just offer more protection against the elements, but they look great too. What more could you ask for from a shed under £400? In terms of quality, the Groundsman range is hard to compete against. However, most of the models available tend to come with windows. 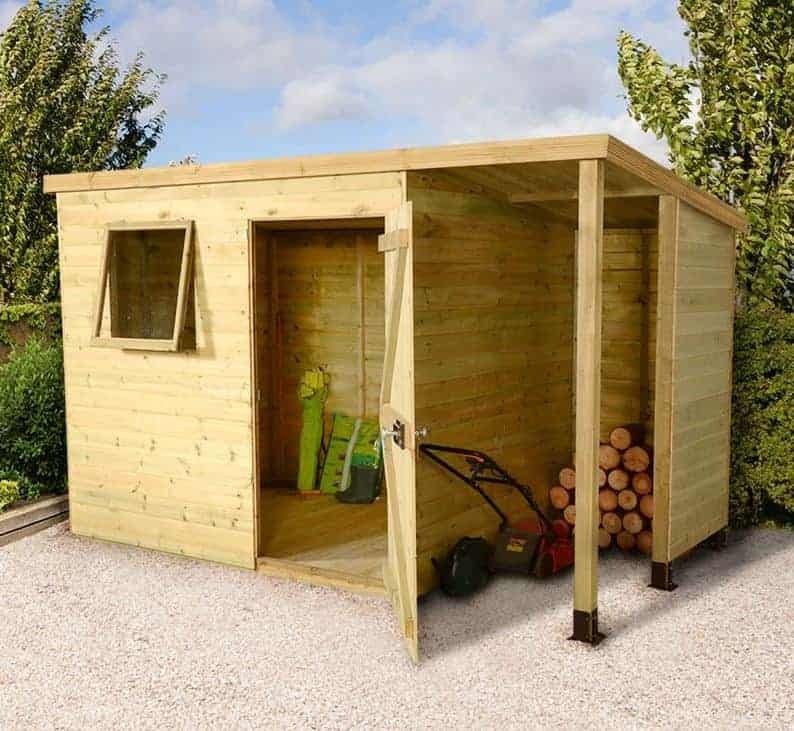 If you’re looking for a more private shed then this Windowless Groundsman 8×6 shed is one of the best you can spend your money on. 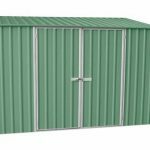 Full 12mm tongue and groove construction on the interior and exterior of the building makes it one of the most stable, tough storage sheds on the market. It also means that unlike a lot of storage sheds, this one can easily hold heavyweight machinery and equipment. It also offers a lot of interior height thanks to its extra tall eaves. 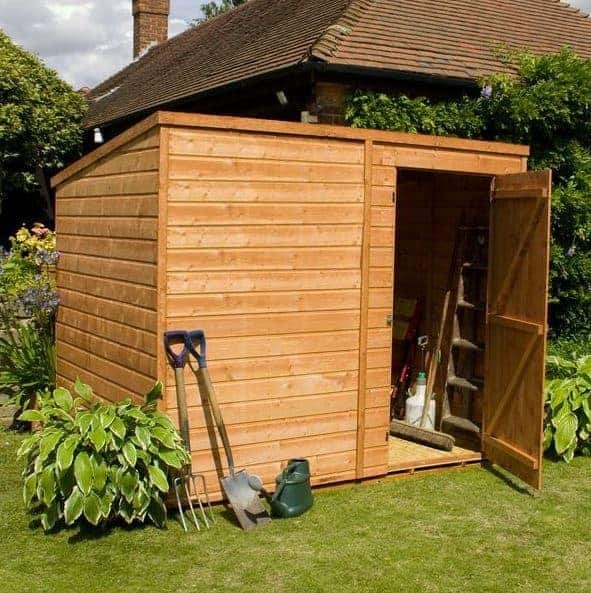 So however tall you are, you’ll find this shed comfortable and convenient to use. We also love the contrasting felt supplied with the shed. Most storage sheds come with a black heavy duty mineral felt, whereas the one on this mode is a dark green. It’s a very small detail that makes a big difference to the overall look of the building. We also praise its outstanding security. An integrated key operated RIM lock gives you total reassurance that any expensive tools, equipment or machinery you store will be safe all year round. If you’re looking for wooden storage sheds that offer superb privacy and a quality you can trust, this is one of the most superior models out there on the UK market. The Palram Skylight plastic garden shed is a very unusual model that we had to feature on the list. Being constructed from polycarbonate panels and held together by a super-strong galvanised steel frame, this maintenance free shed is going to last years. It is virtually unbreakable, making it one of the best quality plastic sheds you can buy. That’s not its only selling point however. As its name suggests, this shed comes with a built in skylight. So you get the privacy of a windowless building without losing natural light. All of the roofs panels are translucent so the amount of light let into the shed is fantastic. It’s a very unique feature that even most of the higher priced storage sheds don’t come with. Its unique features don’t just stop there. The shed also comes with an anti-slip floor, an easy access ramp, back and front air vents, lockable door latches and wide double doors. Its amber colour is also very unique, ensuring the building stands out as a leading focal point in the garden. 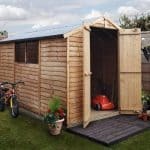 You’ll struggle to find a better plastic shed that offer so many unique features at this price level. Therefore, we are proud to add it to our top 20 storage sheds list. If you want your shed to offer more than a simple storage space, this Shire Casita model with included veranda could be just what you’re looking for. Constructed from quality timber, the veranda is a very exclusive feature that 99% of other garden storage sheds don’t offer. It actually makes the shed look more like a log cabin, only as you can see, it comes at a much more reasonable cost! The veranda offers more than just an attractive, stylish appeal. It also helps to protect the front of the shed from the elements, giving you a great little shaded area. This could even be used to sit out in the shade on hot summer days. Another unique feature that adds to its visual appeal is the Georgian style windows. These give the shed an elegant look and the fact they are fully openable means you can also ventilate the shed to prevent the familiar musty feel that can develop in wooden storage sheds over time. We’re extremely surprised by the overall quality of this building. At this price level we didn’t expect to see such exclusive features. Even the internal framing is thicker than average storage sheds, ensuring a more solid, long lasting design. Unique in every way, this is highly recommended to those looking for something that strays away from the norm. We’ve featured a few pent sheds on this top 20 storage sheds list, but this Waltons tongue and groove model is the first windowless one to be mentioned. 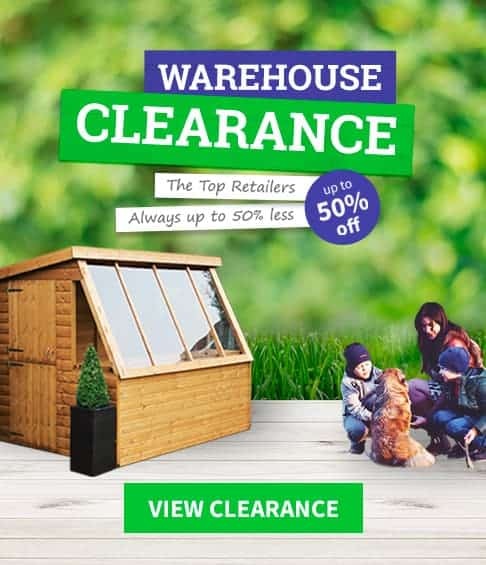 There isn’t a huge amount of choice available when it comes to windowless pent storage sheds, but out of the ones on offer this one is an extraordinary model. Its main selling point is its outstanding quality. Constructed from tongue and groove, it’s going to withstand the elements much better than an overlap shed. The windowless feature also offers significant security benefits too. Not only does it keep all of your storage private, but it also minimises the risk of somebody trying to break in. A pad bolt is included in its design; to which you can add a padlock for great security. The door is also braced to make sure even with heavy daily use, it won’t sag. 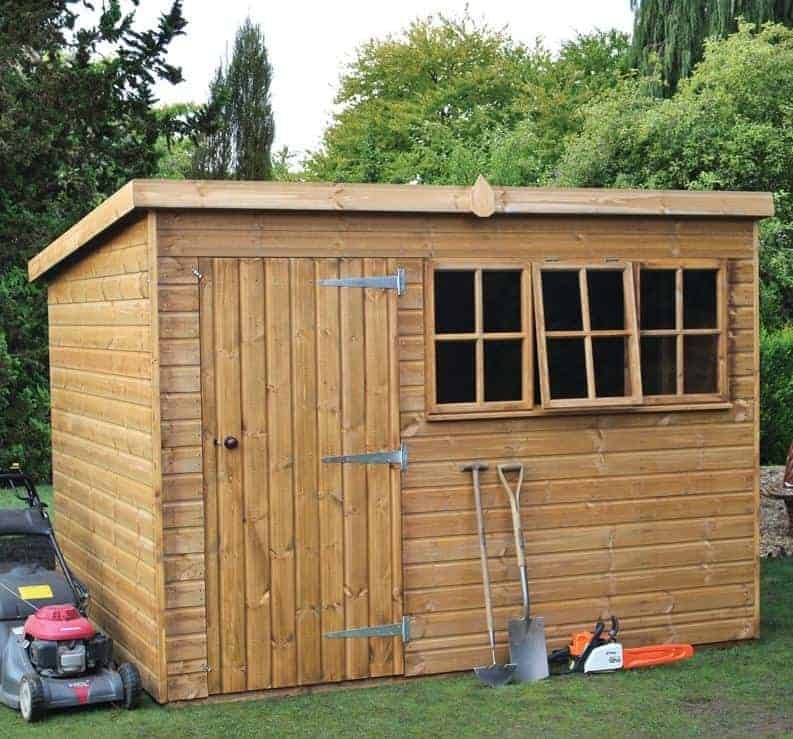 It’s a perfect shed for smaller gardens and yet still provides a great level of storage space. At the budget-end of the scale this great Windsor Overlap shed gives you plenty of great features for your money. It’s one of the largest storage sheds to be featured on our top 20 list, yet it’s also one of the most affordable. Complete with four large fixed styrene glazed windows, the shed benefits from a light, spacious interior. Its large double doors have been created with an ultra-wide 3’6” design, making it one of the most convenient for larger furniture. It comes with a free basecoat treatment to ensure it arrives in perfect condition and it even boasts a long 10-year warranty. Its overlap design gives it a more rustic look and offers reliable weather protection when treated. Due to its low cost and large storage possibilities, this has become one of the bestselling storage sheds in the country. It’s received a lot of positive feedback and offers excellent value for money for those looking for a simple, low cost storage solution. They say you get what you pay for but this great Waltons Overlap Apex Wooden Shed is a great contradiction to that. 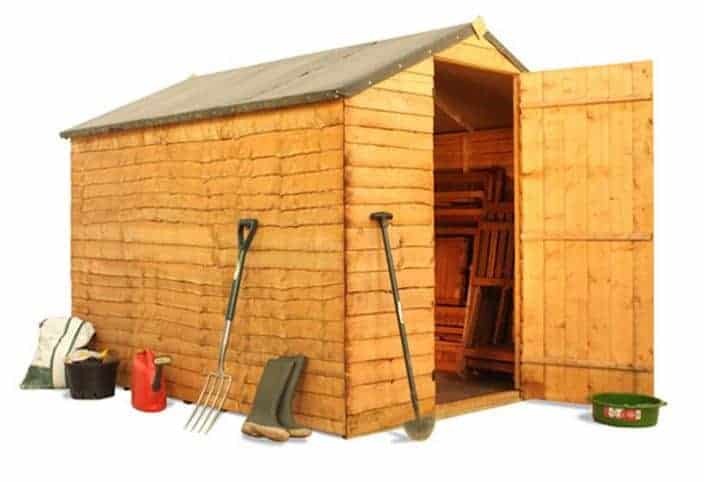 You’d expect that a shed priced as low as this one would be pretty flimsy, less durable and not as good quality as its higher priced competitors. However, this overlap shed provides an extremely solid, reliable and great value design. In fact, when we were researching the various budget sheds available, this one surpassed all others when it came to customer satisfaction. Also, the fact Waltons offer several upgrade options mean you can even choose to spend a little more to further boost its quality if you want to. As standard it comes with wide double doors that are kept securely closed by a turn button catch. Whilst this isn’t going to stop thieves, it’s pretty easy to install a pad bolt and padlock if required. 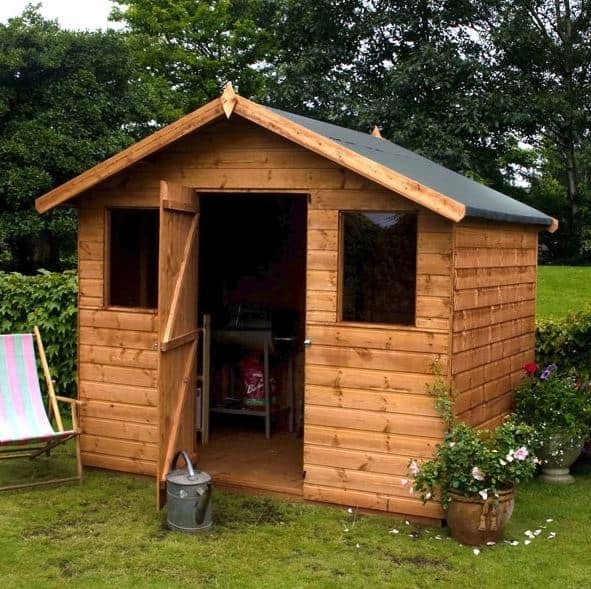 There are actually two features on this shed that stand out to us considering its low cost. The first is the styrene glazed windows. Offering a shatterproof design, these windows allow natural light to filter through, creating a light and airy interior. The second is the door. Now at this price we’d expect overlap sheds to offer a simple, cheap looking door. However, this model offers a z braced feature. This means unlike most of its competitor storage sheds at this price, the door isn’t going to sag through heavy use. 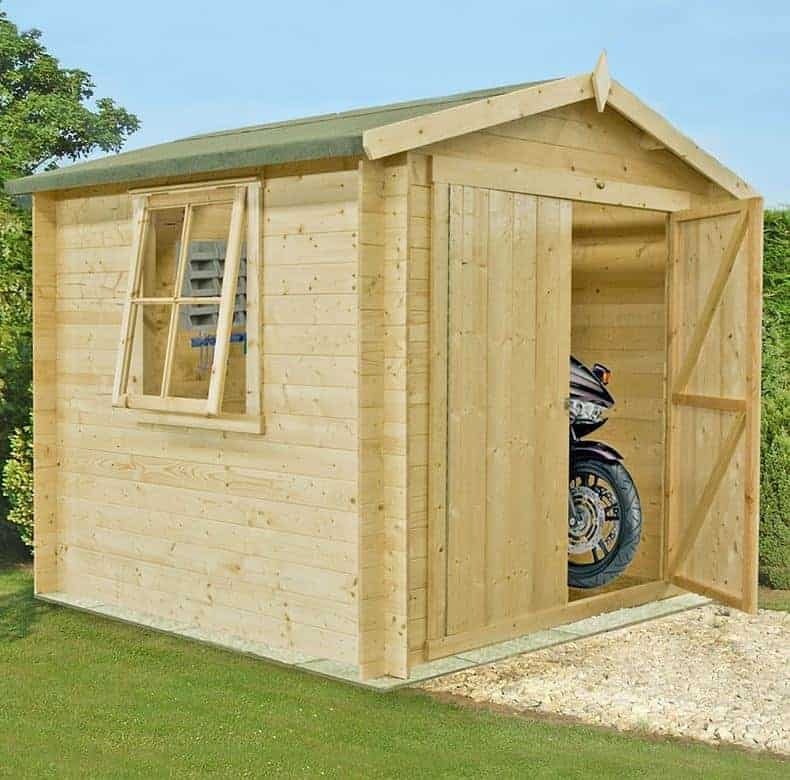 All in all, it’s an impressive entry-level shed that provides extraordinary value for money. With BillyOh being one of the leading manufacturers in the storage sheds market, it’s fitting to end this league table with its impressive Super Saver Windowless shed range. For less than £200, this private, solid building benefits from pre-assembled panels. This makes the installation of the shed fast and straightforward. It’s designed to offer an ‘all-in-one’ storage solution. Available in several different sizes, you can choose how much storage you need. 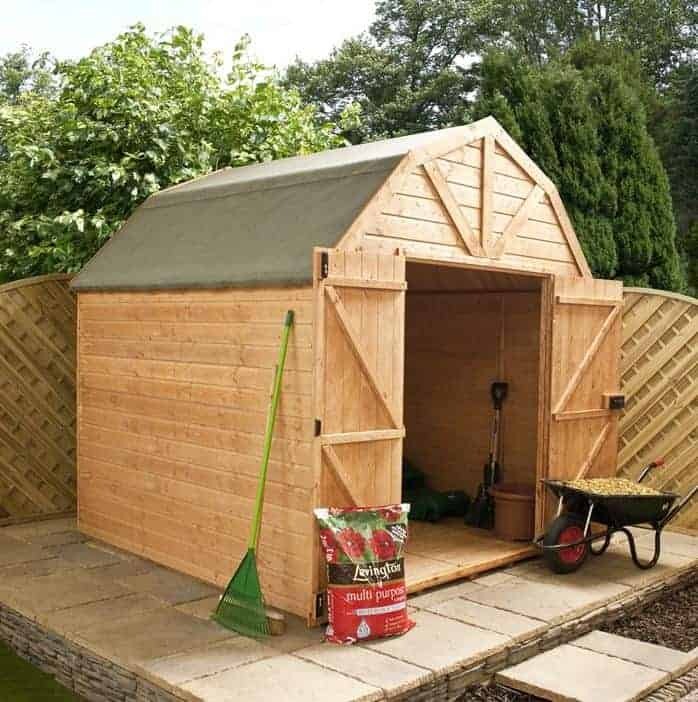 Helping to keep your garden tidy at a fraction of the cost of most storage sheds out there, this model benefits from a traditional rustic design. A floor is also included as standard which again isn’t something you always find with budget priced storage sheds. However, the thing that makes this shed so impressive to us is its customisation options. Add a base and guttering or even change the look of the shed by choosing one of the 11 different colours. It’s a fantastic shed and with its range of sizes and customisation options, it’s suitable for everyone.